85 S T A R T H E R E 2 0 1 8 that will cause ghosting of sublimation transfers. Ghosting happens when as the upper platen is lifted and the transfer paper or fabric moves creating a double image on the shirt. The swing away function also allows for applying transfers to thicker items typically printed with sublimation such as plaques and mousepads. 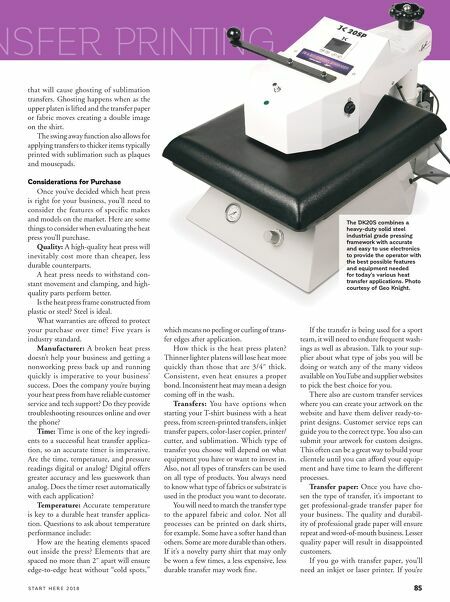 Considerations for Purchase Once you've decided which heat press is right for your business, you'll need to consider the features of specific makes and models on the market. 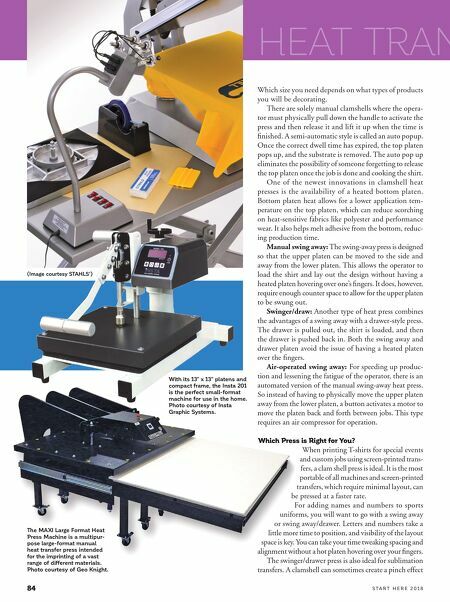 Here are some things to consider when evaluating the heat press you'll purchase. Quality: A high-quality heat press will inevitably cost more than cheaper, less durable counterparts. A heat press needs to withstand con- stant movement and clamping, and high- quality parts perform better. Is the heat press frame constructed from plastic or steel? Steel is ideal. What warranties are offered to protect your purchase over time? Five years is industry standard. Manufacturer: A broken heat press doesn't help your business and getting a nonworking press back up and running quickly is imperative to your business' success. Does the company you're buying your heat press from have reliable customer service and tech support? Do they provide troubleshooting resources online and over the phone? Time: Time is one of the key ingredi- ents to a successful heat transfer applica- tion, so an accurate timer is imperative. Are the time, temperature, and pressure readings digital or analog? Digital offers greater accuracy and less guesswork than analog. Does the timer reset automatically with each application? Temperature: Accurate temperature is key to a durable heat transfer applica- tion. Questions to ask about temperature performance include: How are the heating elements spaced out inside the press? Elements that are spaced no more than 2˝ apart will ensure edge-to-edge heat without "cold spots," TRANSFER PRINTING which means no peeling or curling of trans- fer edges after application. How thick is the heat press platen? Thinner lighter platens will lose heat more quickly than those that are 3/4˝ thick. Consistent, even heat ensures a proper bond. Inconsistent heat may mean a design coming off in the wash. Transfers: You have options when starting your T-shirt business with a heat press, from screen-printed transfers, inkjet transfer papers, color-laser copier, printer/ cutter, and sublimation. Which type of transfer you choose will depend on what equipment you have or want to invest in. Also, not all types of transfers can be used on all type of products. You always need to know what type of fabrics or substrate is used in the product you want to decorate. You will need to match the transfer type to the apparel fabric and color. Not all processes can be printed on dark shirts, for example. Some have a softer hand than others. Some are more durable than others. If it's a novelty party shirt that may only be worn a few times, a less expensive, less durable transfer may work fine. If the transfer is being used for a sport team, it will need to endure frequent wash- ings as well as abrasion. Talk to your sup- plier about what type of jobs you will be doing or watch any of the many videos available on YouTube and supplier websites to pick the best choice for you. There also are custom transfer services where you can create your artwork on the website and have them deliver ready-to- print designs. Customer service reps can guide you to the correct type. You also can submit your artwork for custom designs. This often can be a great way to build your clientele until you can afford your equip- ment and have time to learn the different processes. Transfer paper: Once you have cho- sen the type of transfer, it's important to get professional-grade transfer paper for your business. The quality and durabil- ity of professional grade paper will ensure repeat and word-of-mouth business. Lesser quality paper will result in disappointed customers. If you go with transfer paper, you'll need an inkjet or laser printer. If you're The DK20S combines a heavy-duty solid steel industrial grade pressing framework with accurate and easy to use electronics to provide the operator with the best possible features and equipment needed for today's various heat transfer applications. Photo courtesy of Geo Knight.